”I ask not only on behalf of these, but also on behalf of those who will believe in me through their word, that they may all be one.” (John 17:20-21a). There’s not much talk of ecumenism these days—not in books, not on blogs, not even in and among churches. Maybe that’s because forty years of dogged efforts at dialogue and mutual understanding have borne some real fruit: Calvinists are far less suspicious of Catholics than they used to be and vice versa; Methodists and Lutherans are now in full communion with one another. Of course, the ecclesial traditions most vested in the ecumenical movement are now among those experiencing significant decline, and the growing churches—Pentecostal, non-denominational, “emergent” of this or that variety—don’t seem to place the same high premium on bridge-building and cross-over conversations. So maybe it’s too soon to say “mission accomplished” when it comes to Church unity. Of course it is. Jesus’ prayer in this week’s Gospel reading is a stinging reminder of his Body’s continued disunity. But what can and should be said about this obstinate, obvious reality? How does one preach this familiar text in ways that signal urgency but not despair, that convey the gravity of our predicament while also offering a word of hope? I have no idea. But here are a few thoughts . . .
2. The unity of the Church does not subsist invisibly through “faith” or by assent to propositions, but is to be visible and material. The reason for oneness is “that the world may believe that you have sent me.” Unity is shared witness not intellectual agreement. 3. It is the Eucharist that constitutes this unifying witness in the world. Through the sacramental gifts of Christ’s body and blood, the community receives itself—it becomes the body of Christ, blessed, broken, and shared. As the Great Thanksgiving says, we are made “one with Christ, one with each other, and one in ministry to all the world.” In this act the Church is united across time and distinctions between the global and the local are collapsed, for in every local assembly is the whole body—“the world in a wafer,” as Bill Cavanaugh has said. The Church is–there and then, here and now–the visible body of its Lord. And this visible body does not express or evince the Church’s unity; it is the Church’s unity. But the Church is divided. Still. John probably included Jesus’ prayer in his Gospel because of doctrinal strife in his own community. Discord then and now. Yet while the scandal of disunity persists, Jesus prays for us still. This is the good news. But it does not relieve us of our responsibility to practice the unity that is the triune God’s and that is God’s gift to us. How will Christ’s body, divided by differences both petty and consequential, receive this gift and bear visible, material witness to God’s own life and love? Thank you for your thoughtful words Debra. One thing that sticks with me, and has been a challenge throughout my life, is your statement that “unity is shared witness not intellectual agreement”. I would certainly add political and social agreement to that. I’m constantly astounded at how different Christians can be, yet we all believe we are Christ’s witnesses in the world. What if we were to see unity as the premise and not as the conclusion? 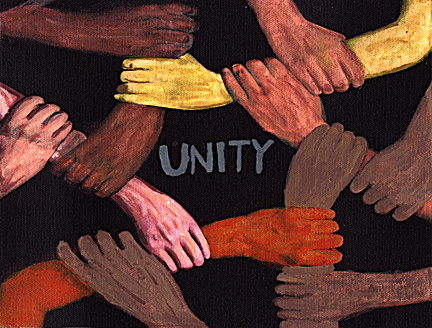 Don’t you think that we tend to see unity as the outcome or the end product when it should be the starting point? If we were to let everything else about the way we live be dictated by unity then I think we would do a much better job at following what Christ has in mind for us. Instead, we too often have the mindset of thinking that if everyone else would just get on board with me or with us and think the way we think or live the way we live, THEN we could have unity. There should be diversity in unity. And, unity should be the place where we start. I remember how painful it was to be at the Ekklesia Project Gathering last year (my first time) and to participate in the footwashing. On the one hand, my heart was overwhelmed with gratitude to have Christians from historically divided tribes visibly showing affection, appreciation and unity. But my heart was simultaneously overcome with anger and sadness that we wouldn’t eat and drink the meal that Jesus instructed us to eat and drink. It was a real problem for me. In one way, I think eating the meal together is a powerful witness to our common Lord and our future. We should participate in it not based on historic divisions, but on our common destiny. It is an eschatological act. But in the same way, I know that the church must be ‘visible’ in the way you described. I don’t think it’s right to ignore those historic divisions or act outside of our particular traditions. Well, I lean towards celebrating the supper anyways. But that’s from a man trained since rebirth in the ways of Protestantism, so what are you going to do? Thanks for your comments, friends. Chris, you remind me that we live in a church culture now that often is more concerned with political unity than with working and witnessing together. I really like what you propose, Nola–I think the difficulty comes back to what Chris hints at: the exertion of our individual wills rather than their surrender to the common good. Joey, I hear you. It’s so hard–and frustrating and disappointing . . . Our inability to share the Eucharist reminds us that a lot of issues are tangled together in this problem: church authority, sacramental theology, baptism, etc. Which doesn’t mean we shouldn’t try hard to do some untangling. Quoted you in a sermon for Ascension Sunday and gave you credit 😉 Good observations. Just celebrate Mass, and the let the chips fall where they may. And keep on doing it, every day, everywhere. Eventually, God wins. Trust God. To follow the unequivocal command of Jesus in the Gospel trumps human ecclesial structures. Thank you, Rev. Johnson–I appreciate that. I think there’s a lot of wisdom in what you say, David; I’m sure that too often we think of unity as “our” job. But there is a sense in which are participants and partners in the divine work of reconciliation–I guess it’s figuring out the how of that.